Hello again - Welcome to a new year and a new blog entry! a habitable artificial satellite, in low Earth orbit. The ISS is the largest human-made body in low Earth orbit and can often be seen with the naked eye from Earth. With the blatantly copied and pasted intro now out of the way, it's probably the time to let you in on my ISS debut, as I've been into this astro photography lark for some time now, yet haven't attempted to photograph the space station during this time. I've read about it and always fancied a bash at capturing its movement, but haven't actually put my arse into gear and done anything about it. "It's only a light moving slowly across the night sky" I told myself. It does actually pass over during the day, but you have as much chance of finding hen's teeth, than seeing a daytime ISS. With the introduction of apps that go something like "ISS detector" and "ISS Spotter", amongst others, the task of an ISS sighting is now as easy as it possibly can be. With the detector app now downloaded and installed on my trusty Galaxy S9, it was now time to put this little game changer through its paces. Upon first inspection, this app really is the box of tricks I hoped it would be. Not a great deal of information at hand when you first delve into it, but all the relevant information is at your finger tips, so what more could you ask for - it is a FREE app after all. First up, there's the fly by date and precise timing. Then you've nailed down it's starting point, according to the built-in compass, which is telling me the ISS is coming at me from a westerly direction, heading to a south eastern point as it disappears from view. All fairly straightforward then, or so it seems. But where will the space station appear, I wondered. Will it be high … will it be low … or even somewhere in between? Wonder no more, bonny lad … the app is your friend and it's telling you it will appear at an elevation of 40 degrees. Ah well, that's the last box ticked, I told myself. Time to pick a location and get over there to set my gear up. So now I find myself at the Angel Of The North, with a clear sky above and a clear view from west to east, which is roughly the path the IIS will take, approximately 20 minutes from now. Dusk is among us - the blue hour, as it's known in photography circles. Not a cloud in the sky, so all is good and game is most definitely on. Based on the information my app has provided, I set up my camera in relation to bagging a good composition. 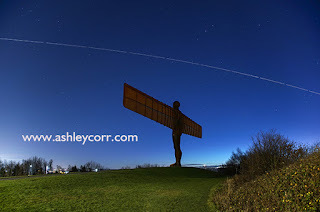 I don't want the ISS leaving its light trail along the top edge of my frame - Niether do I want the trail to be partially obscured by the angel itself. Elevation is now key to pulling in the shot I'm after. I'm facing south, so I'm gonna fit the flight path in … no probs there. With 2 minutes remaining before fly-by, I haven't .got time to reposition my camera, so I 'll simply run with how it's positioned right now - my first guesstimate! And there she blows … bang on time and bang on compass! The finished composition shows a series of 30 second exposures, with 1 second gaps in between. The gaps show how fast the ISS is travelling in such a short amount of time. I'll just leave it there. Mission accomplished. Over the moon - LITERALLY!